This genre of dance has its roots in early courtship dances. Social dances are partner dances; they reflect our need to be socially connected to others. Ballroom dance is one form of social dance, as are contemporary partner dances like the tango and the Lindy. You may now have a good idea about what your job is during rehearsals and performances. Now you need to understand how the entire staff works together to create a performance. 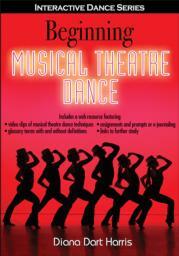 A textbook for college and university general education and dance students. Also applicable for high schools offering beginning musical theatre dance courses.